This is what a Sharp MX-7090N looks like before it’s assembled. There are dozens of pieces that have to be installed in a particular order, in a particular way, before the machine can be powered on for calibration and setup. Skelton Business Equipment has spent hours perfecting your copier’s setup and calibration before it even arrives in your office. Everything you see here is part of a Sharp MX-7090N that can output color documents at 70 pages per minute, with full bleed top-to-bottom, and face-trimmed before it exits the machine. This system is top of the line in Sharp’s light production series. Skelton Business Equipment does not charge a setup fee, a calibration fee, or a delivery fee! Contact us today to setup a print audit at your office. One of our professional representatives will do a quick scan of your network and come up with a solution for your business. We are the premier Sharp dealer in Houston, TX. 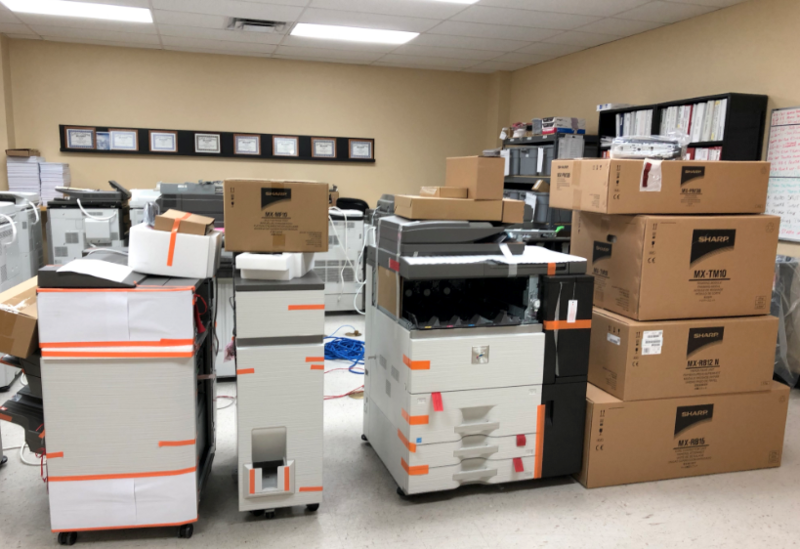 Whether you’re looking for a new or used (refurbished) copier, we can get you fixed up with leasing or a purchase price quickly. Contact us today!